Last year Elon Musk made re-useable rockets a reality . The dream of human activity on Mars inches ever closer. Meanwhile we’re cursing at the repair costs of a washing machine – it’s cheaper to replace. Why can’t Elon’s vision of re-use and repair work for our home appliances? It’s Circular Electronics Day – We’d like to highlight some good news about what the EU is doing to help…and it’s not rocket science. With the galloping evolution of technology, our home appliances now benefit from ‘indispensable’ characteristics allowing them to fit better with our needs. For example, today’s new fridges can send an alert to your phone if you leave the door open , maybe in exchange for data concerning where you are and photos of your cat falling from a table. You might think that it would simply be better to have doors which close properly (and not intrude on your privacy), but hey, this is 2019! You might also think that all these gadgets will make fridge repair rocket science and you might very well be right. Back in 2013 we, RREUSE, spelled out a range of obstacles our re-use and repair colleagues were experiencing in the field – our example products included the humble washing machine, dishwasher and fridge. Access to spare parts, difficulties in product disassembly, and access to necessary information and software for repair were all key issues raised. Our principle demand was to ensure products entering the EU market are easily reparable and not only energy efficient, the primary focus of EU regulators at the time. 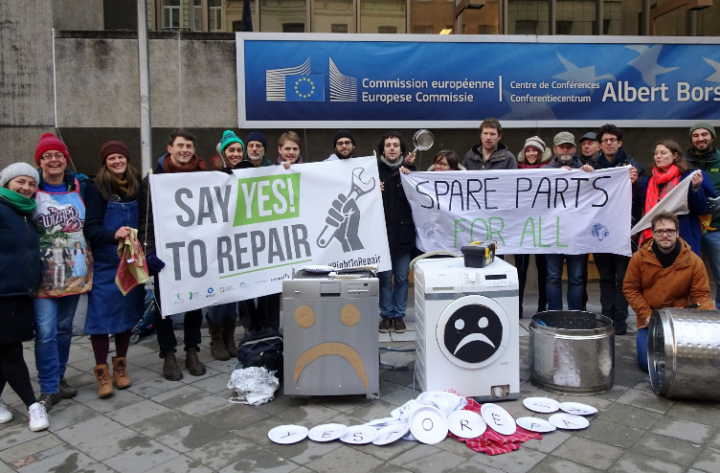 Zip forward to the beginning of 2019, where we found ourselves standing outside the European Commission on a freezing January morning shouting ‘long live the washing-machine’, shoulder to shoulder with supporters and campaigners of the growing Right to Repair movement. The reason? National governments were about to agree on new rules for a number of product categories regulating product eco-design that would take into account product reparability. The final results look promising . Whilst the requirements could and should have been stronger, we are pleased to see that at least some of the issues RREUSE and other key stakeholders have been raising over the years are starting to be addressed. Working together with ally NGOs, repair initiatives and companies including ECOS, the EEB, the Repair Café movement, the Restart Project and IFIXIT, these common messages are being heard by the decision makers. We are slowly seeing more legal meat on the bone to support repair, beyond encouraging words. Whilst there are a number of different policy routes to encourage product reparability beyond eco-design regulations, the recently adopted rules for washing machines, dishwashers and fridges set an important precedent for other product categories to follow. The Right to Repair movement is gathering momentum. In the words of Elon Musk, ‘if something is important enough, even if the odds are against you, you should still do it’.